Make sure it is completely on before you do it up. Even if it is a self donning suit, get your buddy to do it up — that's what your buddy is for! 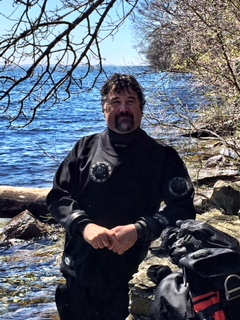 A drysuit zip is extremely expensive. There is no reason why it should not last for many years with the right care. Do not store it in the boot of your car, or in a wet pile on the garage floor. Hang it up, by the waist. Do not stand under the shower to wash it. Take it off and give it a good slosh around in a tub of water. Use wetsuit wash. It is anti-fungal and anti-bacterial and keeps the fabric and rubber soft. Bacteria breaks down the fabric. Never use bleach, never put it in a washing machine and NEVER put it in a dryer! Do not hang it on a typical hanger when it is wet — it is too heavy and puts enormous stress on the shoulder area. Hang it over a piece of water pipe or similar, from the waist, IN THE SHADE. If you damage the suit, or a seam unravels, it is important that it is repaired before the fabric delaminates. It is much more difficult and therefore costly, to repair it once this happens. If you have latex seals use only unscented talc or lube. If you need to trim the neck, do it one ring at a time and make sure there are no nicks. Nick = torn seal soon. Make sure the suit is completely dry, inside and out, before you put it in a storage bag. Do not drag on the end of the zipper. To remove the sleeve, get that trusty buddy to grip the sleeve on either side of the wrist, supporting the junction of the seal to the sleeve. Do NOT get him to pull, just hold. You pull your arm backwards out of the sleeve. This will look after the seal, the zipper and your wallet.